Summary: Old ways are pitted against new horrors in this compellingly crafted dystopian tale about a girl who is both healer and seer. Two hundred years from now, blood has become the most valuable commodity on the planet—especially the blood of aboriginal peoples, for it contains antibodies that protect them from the Plague ravaging the rest of the world. Review: I wish I liked this book more. 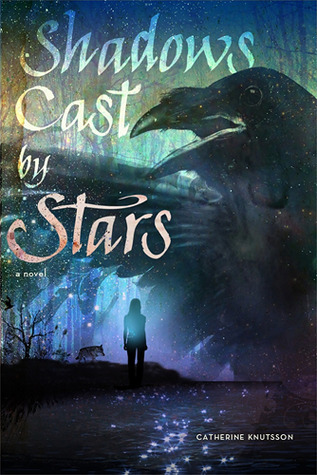 As a moving-to-a-new-town book, Shadows Cast by Stars is serviceable. Cass’s struggles to fit in with the people on the Island—including wanted and unwanted attention from boys—make for some interesting character dynamics and conflict. I particularly enjoyed Cass’s scenes with Madda and her (sort-of) friendship with Helen. The women are the most memorable characters in the novel, though the boys don’t give them much competition in that regard (more on this in a bit). Unfortunately, I wasn’t invested in Cass’s relationship with Bran. They fall for each other far too quickly for my taste, and their relationship crosses off most of the plot devices for romances (down to an ex-girlfriend stealing a kiss in such a way that the heroine thinks the boyfriend is cheating on her). It doesn’t help that Bran spends large chunks of the story away from Cass, so they end up hitting their relationship milestones really quickly compared to how many hours they actually spend together on-screen. I have three major complaints with the book, and the first is a matter of expectations. Based on the summary, I was expecting there to be a lot more time invested in exploring this particular disease-ridden world. I wanted to see the cultural, social, and legal ramifications of a world where the government is totally okay with draining people of all their blood in order to stop the spread of Plague. The premise promised me all sorts of interesting possibilities, from a black market for blood to exploitation to national testing and IDs. I got none of that. The most I got was a chip in all the Corridor citizens’ wrists which let them…connect to the internet? The details are supremely fuzzy and leave more questions than answers: Why doesn’t the government keep better tabs on the people who are the only cure for the Plague? How could our heroes possibly have had time to run when a new plague outbreak occurs? Why isn’t there some kind of set-up where everyone immune to the Plague donates plasma/blood/etc. every [X] days, gets paid handsomely for it, and then the government distributes those vaccines/cures to the people who can afford to get them? Do the antibodies in Others’ blood grant immunity like a vaccine or is it more of a medicine given once the illness has been contracted? Does this government really think it’s an awesome long-term solution to execute the only people immune to the Plague? What is the government going to do when they’ve “overhunted” to extinction? My second complaint is that many of the characters in the book feel distressingly shallow. Paul spends the entirety of the book as an enigma, and once they get to the Island, Cass spends more time with Bran than him. Neither Cass nor Paul seem to care much about getting ripped out of their lives—the closest we get to them missing anything is when Cass asks her dad if the Island has a school system. (As far as I remember, this never gets answered.) Neither Cass nor Paul apparently had any friends or even extended family in their previous lives. There was one attempt to humanize Avalon, which fell flat for me, Cedar was creepy and probably triggery, and Grace was creepy with a side order of broken. Much of the time these characters (except for Madda and Ms. Adelaide) simply didn’t seem to live in the world they inhabited. My third complaint is that the culture of the Island felt really off to me. I’ll be the first to admit that my experience with literature starring or written by native people is pretty limited, but even I was able to pick up on many of the problematic bits that Debbie Reese identified. The mixture of Greek mythology and Arthurian legend didn’t mesh well with the story and were distracting (minor) players in the narrative. Frankly, I would have much preferred that they weren’t included at all. Recommendation: Just skip it, unfortunately. While there are a lot of interesting ideas in the story, they got all tangled up around each other.